Germany was slow to become a colonial nation, and despite finally acquiring many colonies in Africa, these failed to make a net profit over the few decades that it was able to hold onto them. Nevertheless, Germany managed, like those who came to Africa before it, to soak it hands in the blood of Africa’s people. 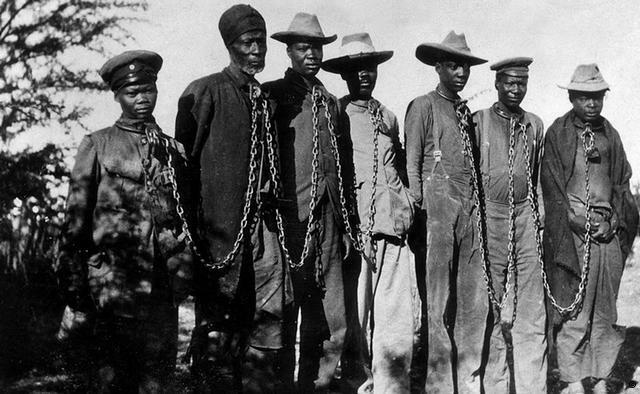 Namibia in South-West Africa was the only colony that Germany considered of real value, and that is where the first of many genocides of the 20th century was committed. Two of the biggest tribes, the Herero and the Nama, rebelled against German colonial rule after having their lands and cattle stolen, and General Lothar von Trotha was sent to crush them. He defeated the Herero in the Battle of Waterberg in August 1904, and then drove the whole tribe into the Desert of Omaheke where he poisoned the water wells so that the whole tribe would die. About 65,000 of the Herero tribe were exterminated from an initial population of 80,000, and 10,000 of the Nama tribe were exterminated from an initial population of 20,000. The survivors were placed into concentration camps to die slowly of hunger and maltreatment. German scientists performed experiments on them in the concentrations camps: Dr. Bofinger worked on Herero suffering from the disease scurvy, but he didn’t try to cure them; rather, he injected them with arsenic and opium and then cut-up their bodies to research the effects of these substances. Eugene Fischer, a German anthropologist, conducted experiments on race to support the idea that Germans were a master race, and this laid the foundations for Hitler’s racial philosophy. Even the dead were not spared, and 300 skulls were sent to Germany for experimentation. The Germans were as ruthless as the French in using the ‘Enlightenment’ philosophy of ‘total war’ to crush whole populations, and they each took delight in chopping the heads off their victims. However, the Germans took this to a horrible new level by using the heads for flawed scientific experiments to support the view that they were superior to the people they murdered. This wicked philosophy and the use of concentration camps to collect whole tribes for destruction, would be of service to the Germans 40 years later in Hitler’s Nazi concentration camps. Jazak Allah khair for sharing the history. My question is about the relationship between the Uthmani Khilafah and the German government during this time, and after (World War 1). Can it be said that since the Khilafah allied with Germany, it is complicit in its crimes? If not, how do we explain the Khilafah’s tacit approval of these? No doubt, the Khilafah had its own internal and external struggles, but isn’t this something it should have stood up firmly against? Please do provide a response as I respect your opinion.